Blazor is a WebAssembly based front-end web application framework created by Microsoft that uses .NET, C# and HTML for developing single page applications. Blazor is currently still experimental and should not be used in production. This Community Project provides Web Open Fonts Format (WOFF) barcode fonts, a .NET Standard/Core barcode library and Blazor source code to help front-end web developers generate industry compliant barcodes in Blazor. As a start, the Code 39, Code 39 Extended, Industrial 2 of 5 and POSTNET barcodes are supported. .NET Core 2.1 SDK (2.1.500 or later). The latest Blazor Language Services extension from the Visual Studio Marketplace. 1. Unzip barcodewebfonts.zip on your Desktop. You should see the Web Open Font Format barcode fonts "CCode39.woff", "CCodeIND2of5.woff" and "CCodePostnet.woff". 2. Create a new project by launching Visual Studio 2017 and select "File->New->Project" from the menu. 3. Select "Visual C#->.NET Core->ASP.NET Core Web Application". Enter "BarcodeWebApplication" as the project Name and click on the OK button. 4. Next, select the "Blazor" Template and click on the "OK" button. A standalone Blazor application that runs on WebAssembly will be generated. 5. Next, we will add a .NET barcode library to generate the barcodes. The library will also be used to generate the necessary start/stop and check characters to ensure that the barcode complies with the industry specifications. Right click on "Dependencies" in Visual Studio Solution Explorer and select "Manage NuGet Packages...". Click on the "Browse" tab and search for "NETStandardBarcode". Select "NETStandardBarcode by ConnectCode" and click on the "Install" button. 7. 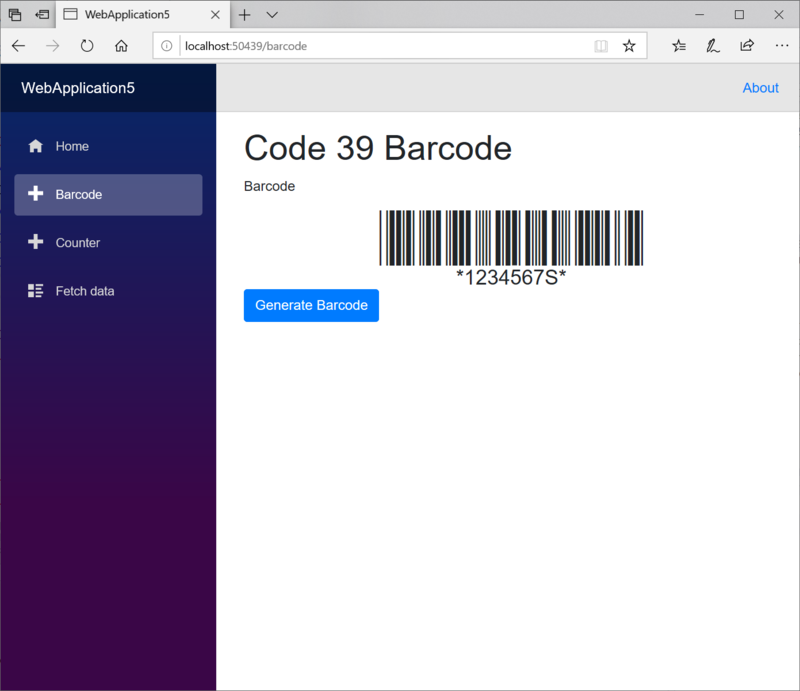 We will need a Blazor Page to display the generated barcodes. Expand "Pages" in "Visual Studio Solution Explorer". Right click on "Counter.cshtml" and select "Copy". Right click on "Pages" again and select "Paste". Rename "Counter - Copy.cshtml" to "Barcode.cshtml". 8. Paste the following into "Barcode.cshtml". The "<div id="barcode">@barcode</div>" element is used to display the generated Code 39 barcode. It uses the Blazor syntax to bind with the C# "barcode" variable. The "<div id="barcode_text">@barcode_text</div>" is used to display the huaman readable text that commonly appears below a barcode. It uses the Blazor syntax to bind with the C# "barcode_text" variable. A HTML button is also defined in the page that calls the "GenerateBarcode" function when it is clicked on. The "GenerateBarcode" function contains programming codes that use the "NETStandardBarcode" nuget library to generate a Code 39 barcode. The generated output is placed in the "barcode" and "barcode_text" variable. 9. In "wwwroot", click on "index.html". Paste the following to the bottom into the "" element. The "@font-face" tag declares the use of the Code 39 barcode web font. "#barcode" will be used to apply the "CCode39" font to the generated output of the previous step. 10. Expand "Shared" in "Visual Studio Solution Explorer". Double click and add the following to "NavMenu.cshtml". When this link is clicked on, it will launch the "Barcode.cshtml" page we have created previously to display the barcode.